Homeless individuals across the country face countless challenges everyday, many that must be overcome simply in order to survive. San Francisco-based artist Joel Daniel Phillips turned his lens toward one aspect of homelessness in particular -- the fact that men and women without shelter often exist on the fringes of society's greater narrative, never getting the opportunity to play the hero or protagonist in daily life. "My drawings are an attempt to play with our voyeuristic tendencies toward the indigence surrounding us, hiding in plain sight," Phillips explained to The Huffington Post. "In the portraits, the subjects cease to be dark matter in our communal space and instead are revealed to be the main characters in their own narrative." Phillips' project began when he migrated to San Francisco four years ago after graduating from college, at which time he moved into his new home/art studio on the corner of 6th and Mission without ever having visited the neighborhood. "I have a very distinct memory of pulling my Budget Truck into the alley behind the space and hearing heroin syringes pop under the tires," he said, "thinking 'what the hell have I gotten myself into?'" The artist soon discovered he now called one of San Francisco's rougher street corners home, and was soon introduced to the crime, poverty, addiction and homelessness that plagued the streets. Although San Francisco is considered the wealthiest city in the nation, it's also one of the most unequal, with 6,436 residents now living without a permanent home, many of whom identify as LGBTQ. Sadly, this number is only expected to rise, and at an even faster rate than overall homelessness throughout the country. "The body of work started as my way of trying to understand the corner I happened to move to," Phillips added. "Amazingly, the process of wandering the corner with my camera and then drawing from the photographs became my ticket into a community that would have likely remained closed to me otherwise." 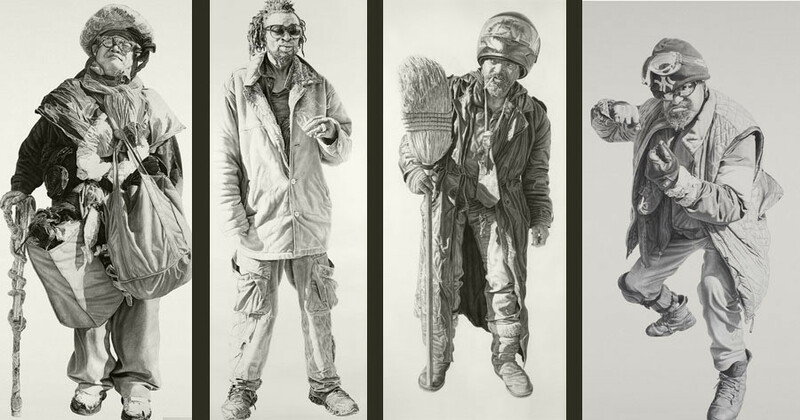 For the past four years, Phillips has created life-size charcoal and graphite drawings measuring in around 42 inches by 94 inches, each depicting an individual who is far more than a stranger on a street corner. 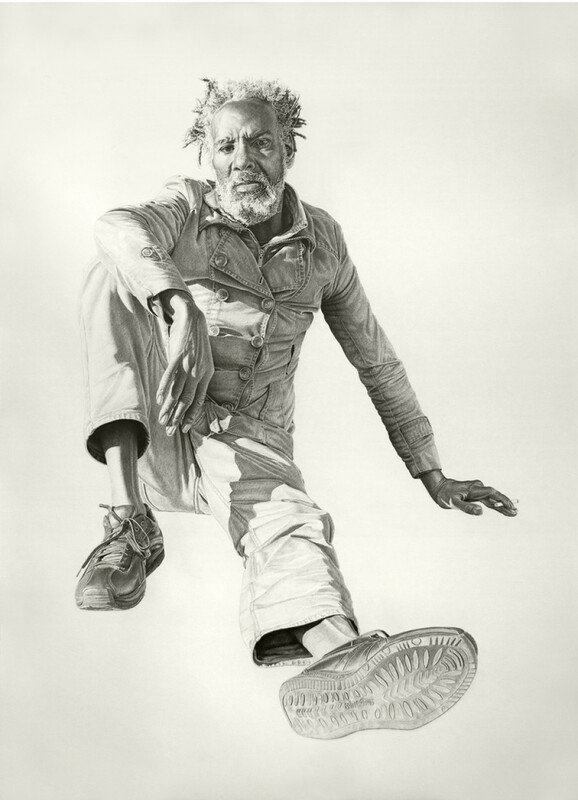 From the wrinkles on their brows to the texture of their sneakers, the posture of their stance to the sparkle of their eye, Phillips' subjects are valued and vitalized in each hyperrealistic rendering. The detailed drawings dictate the level of attention we should pay to all human beings and their complex stories, allowing each and every one of us to be the subject of our own narrative. "Many of the people who live on 6th and Mission are kind of people who we don't know how to deal with on a daily basis -- social dark matter, if you will," Phillips concluded. "The sort of individuals who we bypass on the sidewalk and don't make eye contact with because we don't know how to respond. 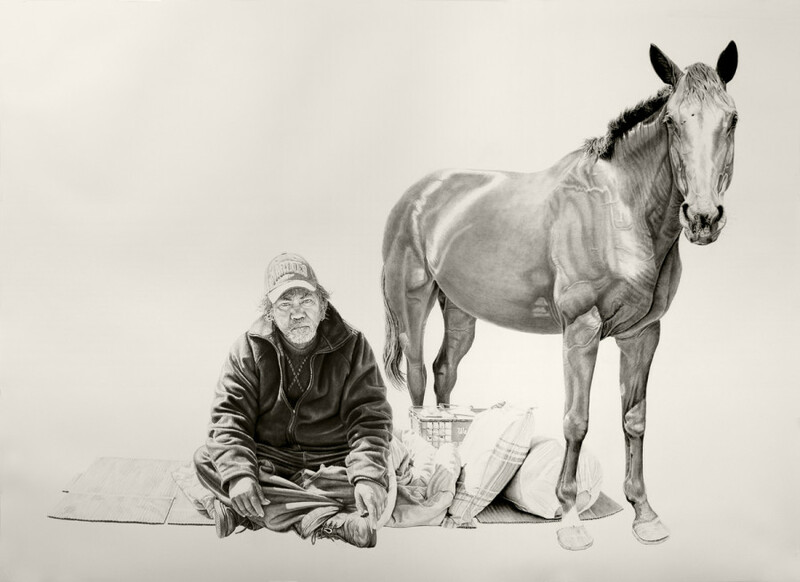 Each drawing is a visual record of my striving to recognize unknown and unnoticed individuals through the tip of my pencil."